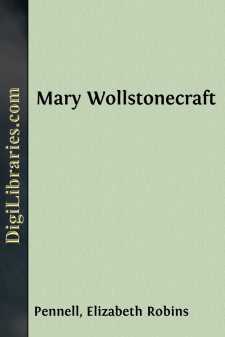 Few women have worked so faithfully for the cause of humanity as Mary Wollstonecraft, and few have been the objects of such bitter censure. She devoted herself to the relief of her suffering fellow-beings with the ardor of a Saint Vincent de Paul, and in return she was considered by them a moral scourge of God. Because she had the courage to express opinions new to her generation, and the independence to live according to her own standard of right and wrong, she was denounced as another Messalina. The young were bidden not to read her books, and the more mature warned not to follow her example, the miseries she endured being declared the just retribution of her actions. Indeed, the infamy attached to her name is almost incredible in the present age, when new theories are more patiently criticised, and when purity of motive has been accepted as the vindication of at least one well-known breach of social laws. The malignant attacks made upon her character since her death have been too great to be ignored. They had best be stated here, that the life which follows may serve as their refutation. As a rule, the notices which were published after she was dead were harsher and more uncompromising than those written during her lifetime. There were happily one or two exceptions. The writer of her obituary notice in the “Monthly Magazine” for September, 1797, speaks of her in terms of unlimited admiration.